Two game-changers for packing simple, budget-friendly lunches. These make-ahead sandwiches help us save money and eat healthy – plus tips for making healthier sandwiches! Packing healthy lunches is a lot of work. Maybe it sounds simple, but it’s not. If you pack lunches, you have to be intentional about what you buy, what you make (is it still going to look appetizing in 4 hours?) how you pack it, and how quickly you assemble it in the morning. You can find a ton of healthy lunch tips online. The internet is full of brilliant practical lunch heroes and enthusiastic overachievers. Today I am sharing the hack that makes the most difference, hands down. While we don’t eat sandwiches every day, they do make a simple and inexpensive lunch. These sandwiches are also easy to make ahead of time so you can keep a stash on hand and use them between healthier lunches. What makes these sandwiches a game changer is that you can freeze them without changing the texture or flavor of the sandwich itself. Simply assemble them, place them in a freezer bag (I put them right back in the bread bag that the loaf came in. If it’s homemade sandwich bread, I use something like these. Peanut butter and jelly sandwiches freeze perfectly. They thaw and taste awesome by lunchtime. If your school or workplace doesn’t allow peanut products, use sunflower butter or other alternatives. I have found that making my own specialty nut butter saves a lot of money, and it takes only a few minutes in the food processor (Tip: buy roasted nuts so you can skip the roasting step). Use natural peanut butter with only two ingredients: peanuts, salt. Try making chia jam or fruit butter! Same with this lunchtime favorite. Don’t use any condiments (or lettuce obviously). Simply layer the lunchmeat and cheese between two slices of bread, line them back up in the bread bag, and place them in the freezer. Feeling adventurous? Try this simple homeme lunchmeat recipe. When you pull out a frozen sandwich, the bread might stick together. Personally, I have never had a problem with it cracking or breaking when I pull them apart into individual sandwiches. However, you can place them in sandwich bags first if you prefer, then freeze them. If you use sandwich bags to pack your lunch anyway, this eliminates a step the night before or the morning of – whenever you make you lunch. Generally, I avoid buying and using sandwich bags because they add another cost and they aren’t good for the environment. But like I always say, do what works for you in this season. half a banana – you know the kind your mom sliced in half with the peel still on so the exposed banana oxidized throughout the morning and turned black and gross by lunchtime? This needs to be part of your kids’ childhood too. Or any of the above of course – except the banana. Don’t do that to yourself. You served your time. Since we packed a sandwich, I try to avoid packing another grain or heavy carb and instead focus on fats, veggies, protein, and maybe some fruit. For some of you lunch-packing geniuses, this is old news. But this was a game changer for me when I figured it out. And whenever I mention freezing sandwiches on Instagram or Facebook, people’s minds are blown. 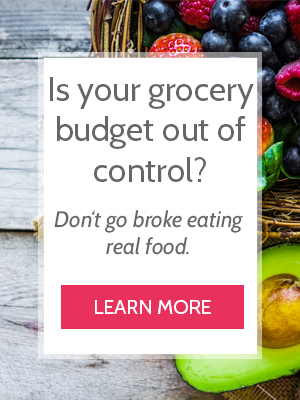 So I hope these tips help you save money – by packing more lunches because they are easier to pull together in the mornings – and eat healthy – by showing you ways to make them with real food. How do you make packing a healthy lunch simpler? Comment below! If you found this post helpful, let us know! Leave a comment, share it on Facebook or Pinterest, and follow us on Instagram or YouTube for more!